Wed, March 14, 2018 7:30 P.M. 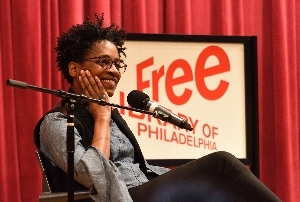 The One Book Finale will feature an interview with Jacqueline Woodson and Tamala Edwards, 6ABC Action News Co-Anchor. The program will also feature a celebration of the poetry and music found in Another Brooklyn, with performances of original works--inspired by the novel--from Curtis Institute of Music composer Chelsea Komschlies, performed by Curtis Institute musicians, and from Philadelphia Youth Poet Laureate Husnaa Hashim.